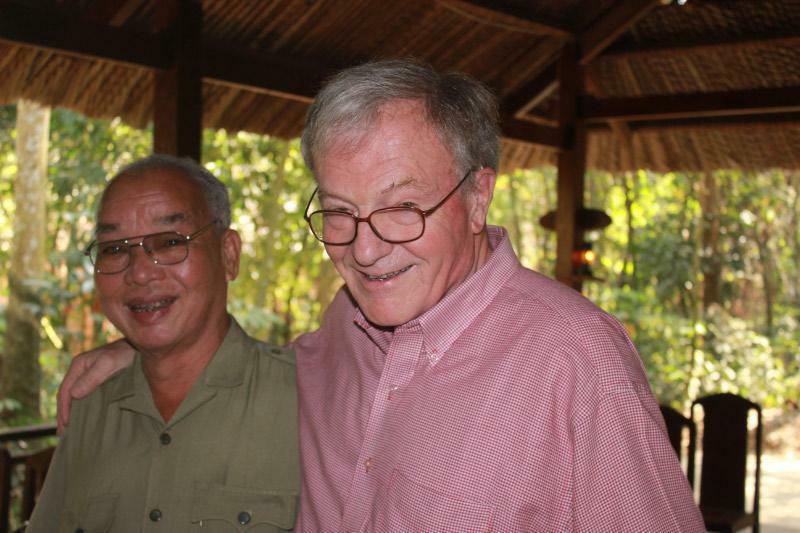 Author Michael Shanahan with Nguyen Chia, a former Viet Cong soldier. HANOI — These days, the former Viet Cong warrior is balding and gentle. At 69, Nguyen Chia, who fought the Americans from the ingenious network of tunnels at Cu Chi, northwest of Saigon, is a grandfather of four. His memories of combat from so long ago are vivid. “I fired my rocket launcher and killed one of the tanks, but the American soldiers in another tank saw me and fired so I was wounded badly,” he said during an interview, a highlight of my 2½ week sentimental return to Vietnam. Robust but reserved, Chia lost an arm in the tank battle, but holds no evident grudge against the Americans. He rated them as good fighters who didn’t understand the war they were fighting. The author as a young Army intelligence officer. As a veteran of the war, it was surreal to sit and chat with the former Viet Cong soldier and realize that 46 years earlier, his job was to kill me and other Americans fighting in the neighborhood. My return to the tunnels — now a tourist attraction — met part of a long-held desire to revisit all of Vietnam. That ambition did not exist in May 1968, when I was desperate to leave Vietnam after playing a tiny part in a war I had come to detest and was anxious to return to civilian life. But as the years passed, I retained a lingering affection for Vietnam and its people. As a US Army intelligence officer, I came to know many Vietnamese whose history of accommodating or resisting various occupying powers is long and deep. And so, like thousands of veterans, I wanted to go back and see what the place looked like now. In February, my wife and I landed in Hanoi and began a journey of exploration and remembrance. We covered every corner of the country: the mountains along the northern Chinese border, the striking beauty of Ha Long Bay, the Imperial City of Hue in central Vietnam, and the floating markets of Can Tho in the lush Mekong Delta. But my main motive was to find places that evoked memories of my dangerous year in the war zone. And I wanted to know how the conflict is remembered among the Vietnamese and how the war is presented to the 7.6 million tourists (432,000 Americans) who come here annually. In Hanoi, we found that American folksingers Joan Baez and the late Pete Seeger are still revered for their musical support of the antiwar movement in the United States. In a hotel, a plaque is dedicated to the memory of Baez’s trips to Hanoi during the conflict. And at the massive stone mausoleum where Ho Chi Minh’s body is on display, a billboard-sized video paid homage to Seeger within a few days of his death in January. A tourist destination showing old Viet Cong tunnels. Throughout our tour, there were many surprises and mysteries. We discovered the little-known Ho Chi Minh Trail Museum, devoted entirely to portraying the network that allowed the North to resupply its forces over decades. Initially, elephants and water buffalo carried the goods over jungle trails; eventually they became roads capable of handling trucks that sometimes ran through Laos and Cambodia and down the South China Sea coastline. While the museum, located about 10 miles southwest of Hanoi, is theoretically open to the public, it looked deserted when we arrived for a tour. Our guide finally called museum administrators to ask them to admit us to what should be a prime tourist stop. Inside, we found a three-story trove of artifacts, dioramas, mannequins, and photographs that captured the engineering brilliance and strategic importance of the supply network which began northwest of Hanoi, and extended south to the Saigon suburbs. No one emerged to explain the displays and photographs of the marvelous images in the museum. So we viewed exhibits like a room-sized simple relief map tracing the precise spider web of roads and trails complete with flashing lights identifying key points along the way. 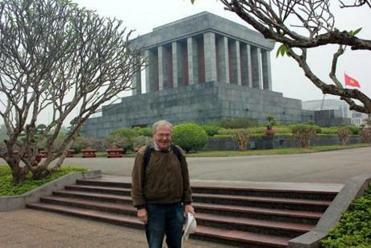 The author in Hanoi, outside the mausoleum that holds Ho Chi Minh’s body. One of the flashing lights was very close to An Loc, northwest of Ho Chi Minh City, where as an Army second lieutenant my sleep was routinely interrupted by booming explosions from B-52 bombing runs aimed at the Ho Chi Minh Trail along the Cambodian border. In downtown Hanoi, we toured a restored section of the legendary “Hanoi Hilton” prison where US prisoners of war, mainly fighter and bomber pilots and navigators like young John McCain were held and tortured in tiny cells — in violation of the Geneva Accords. The museum, officially known as Hoa Lo Prison or “Fiery Furnace,” was originally built by the French when Vietnam was its colony. About 90 percent of its exhibits are devoted to stories and sculpture about torture inflicted by French interrogators on Vietnamese political prisoners in grossly overcrowded cells before the fall of Dien Bien Phu in 1954 and France’s exit from Indochina. Tucked away almost as an afterthought is a section devoted to the imprisonment of US prisoners of war. Displayed are flight suits of downed pilots and pictures of prisoners receiving medical treatment. There was no mention of the torture or mental and physical abuses documented by the POWs after their release. But if the Hanoi Hilton plays down the brutal treatment of American prisoners, the War Remnants Museum in Saigon accuses US forces of “Vietnam War crimes and their consequences,” according to a pamphlet for visitors. A display of the health effects from the use of the chemical Agent Orange harshly condemns the United States with pictures of children disfigured by the use of defoliants to make the Ho Chi Minh Trail visible to bombers and helicopter gunships. Other parts of the museum are neutral and informative, including a world-class exhibit of news combat photography organized by Pulitzer-prize winning AP photographer the late Horst Faas. At our next stop, in the town of An Loc, 50 miles northwest of Saigon, instead of war memories, we found comic relief. It was in An Loc that I spent seven months as an intelligence adviser and I had clear memories of many landmarks, including a French fort with high walls and gun emplacements where I lived, an airstrip where a CIA operative was killed by a land mine, a building for which I supervised construction from mud bricks, and other landmarks. With the help of an 80-year-old grandfather who thought it was grand to buzz around town with us in an air-conditioned van, we searched for something — anything — familiar that had been there in 1968. But there had been heavy combat in An Loc late in the war, including air strikes on part of the town and everything from that era seemed gone. All the physical memories and symbols of my war had seemingly been bombed to smithereens. We stopped to chat with passersby about my quest, and schoolchildren swarmed us to test their English language skills. Our search was apparently reported to the authorities. Two young plainclothes policewomen on motorbikes escorted all of us to a combination police headquarters and City Hall and interrogated our guide inside for about a half-hour. An American war veteran asking questions around An Loc had raised suspicions among the local communist cadre. Our guide, embarrassed, would say only that he had been able to talk his way out of the fix by calling someone in Saigon. So what did I find in Vietnam? I found a wonderfully beautiful country that is on the move economically. If there is bitterness over the US intervention 40 years after our troops decamped, it was not apparent. No Vietnamese mentioned the war unless I brought it up. The Communist government seems intent on increased tourism and trade with the United States and other Western nations. But Hanoi seems conflicted on how to present its version of the war. In some cases, like the Ho Chi Minh Trail Museum, authorities throw a blanket over unpleasant memories. 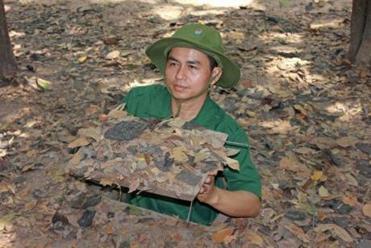 At other sites, like the tunnels at Cu Chi, Western tourists are welcome. And at the War Remnants Museum in Saigon, there is lingering resentment. One of our guides told us about befriending another US war veteran who had returned to Hoi An in central Vietnam five times. The guide and his family now exchange news of their families. In recent years, the guide escorted a group of cruise ship tourists around Hoi An and told a middle-aged American woman about his friendship with the US war veteran. “Do you have a picture?” the woman asked. “Sure,” the guide said, showing her the image. “That’s my ex-husband,” the woman told him. “The world is getting smaller,” our guide told us. Michael Shanahan can be reached at mikeshan@gwu.edu.